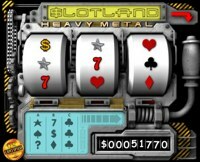 The Heavy Metal is new Slotland casino's 3 Reel online slot machine with 4 pay-lines. Heavy Metal is the first online slot machine ever that allows you to place bets on your game history! Each payline which has a bet placed on it can win. Winnings are based on the symbols on each payline and the amount bet on that line. You can see symbols' combinations from your last 3 spins at all times. It creates 3 new paylines which pay off the same way as the HeavyMetal's main one. If you get, say, a Seven on the first wheel three times in a row, you will be paid 40 times a bet on "Line A". Each wheel's history pays off in the same way, so watch the blue display to decide whether to place your bets or not. Furthermore, a feature "Hold" appears randomly during play. It lets you hold some of the slot's wheels, allowing you to determine your game history for your next spin and, occasionally, to win for sure! Hit 3 Triple Sevens symbols when you bet max and receive growing progressive jackpot. Any "?" symbol is wild and can substitute for another symbol in the payline. Two "?" symbols can be in any position of the payline, three "?" will also pay out. No download needed to play Heavy Metal slot machine at Slotland, just open an account and start to play immediately. Join Slotland now (click the image below) and receive a limited time 100% match bonus up to $100 free. Check out Heavy Metal Jackpot winners stories and testimonials. The average payouts for Heavy Metal slot machine is 98%!